Fay Twydell has provided this photo from 1913 showing her grandmother, Maud Purscell, on her wedding day. She married Francis Wheeler on 13 August 1913 (their marriage was registered in Brentford): 'Note the ring!'. Maud's wedding dress has a pin-tucked bodice and upper arm, full sleeves, a high neck and a darker cloth belt at the waist. She wears a spotted item at her neck and a string of pearls on top. Lace is used to ornament the bodice area and sleeve and her pose shows her wedding ring. 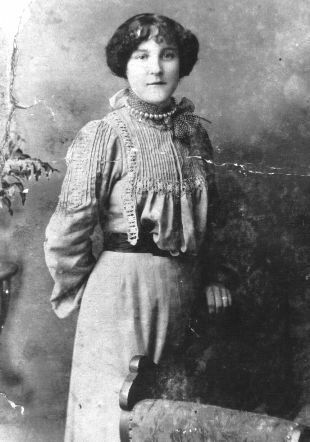 Maud is standing by a heavy, carved wooden armchair with a plant stand to the left - photographed in a studio? See a 1950s photo of Maud Wheeler sent by Fay, showing a group of ladies outside the Magnet pub.